The goal of this assignment is to get you to look at the benefits and perils of using non-text primary sources, in this case art. 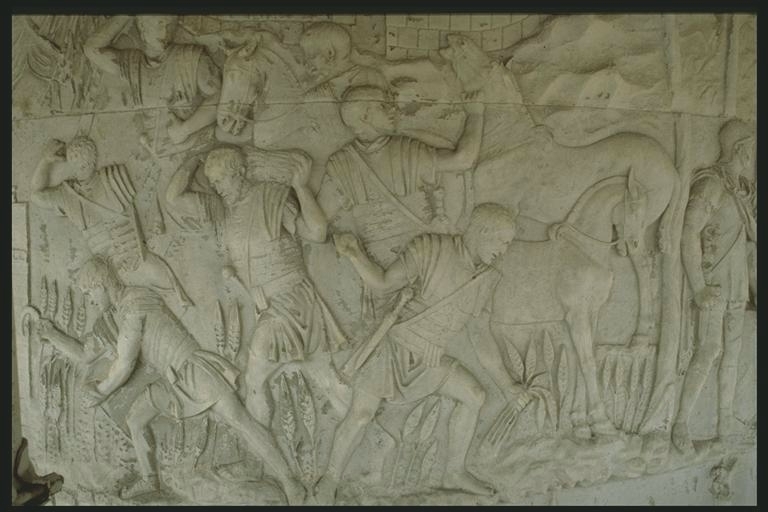 Specifically, I’ve asked you to look at different scenes from the Column of Trajan. 1. Look at scenes about your topic and see what it tells you about the subject. Can you figure out weapons? What they’re wearing? What they’re doing? How do the various scenes support (or not) the information you’ve read in your textbook (Matyszak. Legionary) and elsewhere? 2. Once you’ve done that, it’s time for the harder part. Art is not created, nor does it exist, in a vacuum. When it’s created, why it’s created, how it’s created, what it’s made from, all affect the finished product. As you look at your scenes, think about why Trajan had the column created, why the particular scenes that are shown might have been chosen (for example: look at the Dacians. How are they portrayed? ), how the choice of a column affected the design, etc. 3. Once you’re ready to post, be sure to give proper credit for the scene and the cartoon, if you use one. Mr. Peter Rockwell has kindly given us permission to use his pictures in our blog. Directly under each image, you need to use the caption feature to give credit. For help using the caption feature see: http://en.support.wordpress.com/images/#insert-an-image-from-the-web – the easiest way is to click on the highest resolution image available then copy the URL. 4. The caption should give the following information: Scene number if available, subject of image. Used with permission. Copyright Peter Rockwell. Via http://URL of the image you used. 5. You also need to credit the image at the end of your post using the correct APA or MLA style. I couldn’t get this video to embed correctly. This is a video created by the History Channel on the Battle of Cannae. There were also some enjoyable YouTube videos of Cannae as well; however, I could not figure out how to give due dilligence. August 2 of 215 BC, on the field of Cannae 50,000 Romans lay dead. Eight-thousand prisoners have been captured and the victorious Hannibal following the customs of war had made preparations to capitalize on the situation. Modern scholars and historians Livy and Polybius alike speculate Hannibal was in need of provisions in particular financial support for his campaign and fresh troops. As such, Hannibal may not have wanted take Rome, rather it is possible he only wanted to decrease its power and therefore sent an embassy of roman prisoners to settle the negotiations of defeat. Note: Roman prisoners of war lost their citizenship and patriarchal rights afforded to them. In effect they became the property of the enemy to be exploited or killed as the victor saw fit. However, a roman prisoner of war could gain his freedom by paying his ransom, being recaptured (treated), or possibly petition for freedom if he escaped (Brill’s New Pauly, 878). Unfortunately for Hannibal, at some point at the during the close of the First Punic War, the customs of prisoner exchange had changed in Rome. The governing body in Rome felt no obligation to uphold the customs of the world which they helped establish (Hopkins, 17-18). This change was an ethical change in society which now held strong belief of honor and what it meant to be a soldier of Rome. Romans were not apt to negotiate terms upon their defeat. Hannibal may have underestimated the pride and society of the Roman state (Lazenby, 42). Perhaps this Roman notion of honor is best understood from the senator T. Manlius Torquatur, who was under the persuasion to disallow the liberation of the prisoners of war despite the public opinion. He argued two points. First, the prisoners were idle cowards who made no attempt to save themselves. And second, they didn’t truly defend the camp, and in actuality gave up, reserved to their fate as prisoners of war (Livy, 22.60).Further Livy records the senators held other reservations against the ransoming of the captive Romans, the most noteworthy being monetary (22.61). O’Connell coincides that the refusal for the ransoming of the slaves was strictly a monetary one. As he makes claim that the families of the captive soldiers were denied that ability to pay the ransom (168). Nonetheless, upon these points the senate voted against the ransoming of the prisoners. The decision from the senate was to Hannibal’s dismay, the prisoners we sold into slavery and some slaughtered (O’Connell, 168). Hannibal was ineffective in convincing Roman allies to defect. 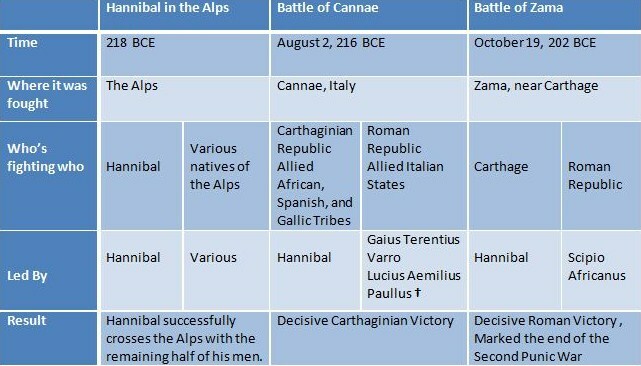 Thus, Hannibal’s plan was then thwarted as his ability acquire necessary provisions for his army and his ability to create battle with the learning Romans. “Hannibal Leads Carthaginians.” 2012. The History Channel website. Feb 22 2012, 9:29 http://www.history.com/videos/hannibal-leads-carthaginians-over-romans. Hopkins, Tighe. Prisoners of War. London : Simpkin, Marshall, Hamilton and Kent Co 1914. Livy, Titus. “Livy’s History of Rome: Book 22 The Disaster of Cannae.” The History of Rome, Vol. III http://etext.lib.virginia.edu/etcbin/toccer-new2?id=Liv3His.sgm&images=images/modeng&data=/texts/english/modeng/parsed&tag=public&part=2&division=div1 18 Feb. 2012. Online. Messer, Rick Jay. The influence of Hannibal of Carthage on the art of war and how his legacy has been interpreted. MA thesis. Kansas State University Manhattan, Kansas 2009. Print. O’Connell, Robert L. The ghosts of Cannae : Hannibal and the darkest hour of the Roman republic. New York : Random House, 2010. Print. “Romans as Prisoners of War.” Brill’s New Pauly: Encyclopedia of the Ancient World. Antiquity Vol. 11 English Ed. 2007. Hannibal employed many soldiers from many different places. His army consisted of soldiers from Africa, Spain, Italy and he even had Celtic soldiers. Each group of soldiers brought their own culturally used armour and weapons to battle with the Romans. The African soldiers wore very colorful uniforms that came in different varieties. The heavy infantry wore chain mail over their clothes and carried heavy shields. They mostly fought with an assortment of exotic weapons which they were well trained with and proved to be useful and deadly when they wielded them. They also used spears and long and short swords. The Iberian or Spanish soldiers carried wooded shields and used sling and javelins as well as swords and spears. The heavy infantry also wore chain mail and used the typical heavy roman sword. They also used the falcata which is a sickle shaped sword made of iron or steel. The falcata is made from 3 lamina or sheet of steel. 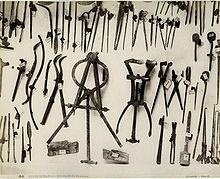 The Celts or Gauls were armed simple iron long swords. The swords weren’t of very good quality and were used more effectively when hacking rather than stabbing (Polybius). Both Plutarch and Polybius describe the Celts as often ceasing fighting so as to straighten their swords. Polybius and Livy also assert that the Celts didn’t wear any armour and often fought naked. The Battle of Cannae was fought between the Romans Republic and the Carthaginian Republic. The Carthaginian commander was Hannibal and the Roman commanders were Gaius Terentius Varro and Lucius Aemilius Paullus. The war took place near Cannae a town in southeast Italy. Hannibal’s army defeated the Roman army even though the Roman army was greater in number. The victory is credited to the fact that Hannibal’s army used superior tactics and they were united in their efforts (The Battle of Cannae). The health of the soldiers before the war and the treatment of the wounded during and after the war was an important part of maintaining the effectiveness of an army. The conditions that the soldiers had to endure and the number of people in an area created complications for the sick and the wounded. During that time in history medical facilities where important and many times would be based in temporary camps. The Greeks and the Romans both had made many discoveries for medical treatments by this time in history, so it was not uncommon to have a doctor (medicus) who was highly skilled as well as assistants who would oversee the operation of the medical facility (Goldsworthy). Goldsworthy, Adrian. The Complete Roman Army. London: Thames & Hudson Ltd., 2003. 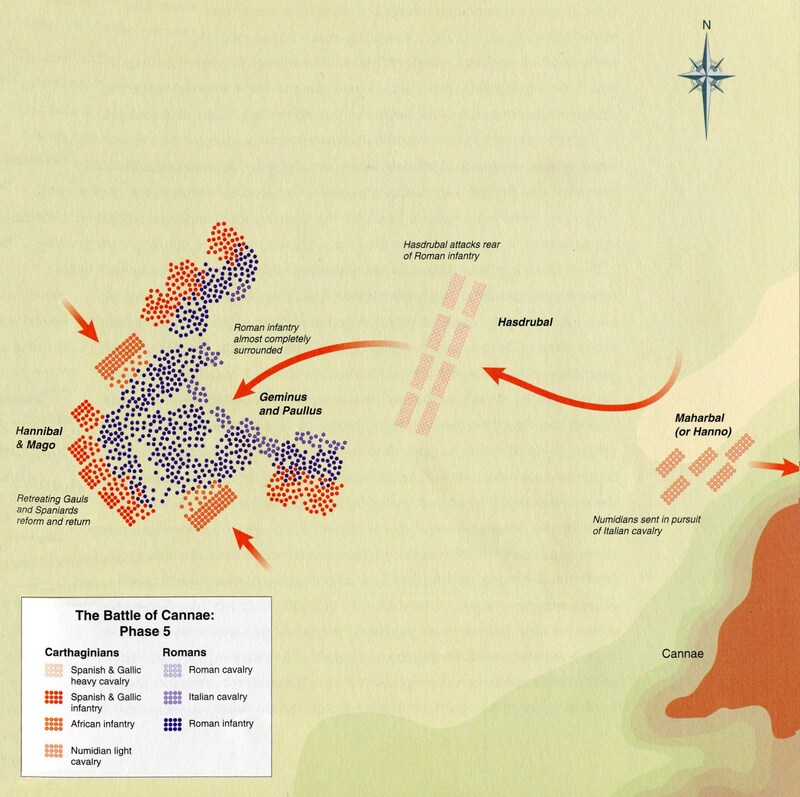 The Battle of Cannae. 8 Feb 2012. 16 Feb 2012. <http://en.wikipedia.org/wiki/Battle_of_Cannae&gt;. August, 216 B.C: near the small township of Cannae, a mere two hundred fifty miles from Rome, Hannibal of Carthage and his army prepared for battle. They were faced off against the legions of Aemilius Paullus and Caius Terrentius Varro, the Consuls of Rome. Under normal circumstances, one consul and a couple of legions was enough to stir optimism in a Roman victory. “On the occasion in question, however, they were so alarmed and terrified that they decided to send not just four, but eight Roman legions into battle at once” (Polybius 213) as well as both of their consuls. These were also extended legions, each consisting of 5000 infantry and 300 cavalry instead of 4000 and 200 respectively (Lancel 104). Legionary command alternated every other day for Paullus and Varro, who disagreed on nearly everything. On August 2, 216 B.C., it was Varro’s turn to command the army. Just after sunrise, he led his troops out onto the battlefield, forming a continuous line facing south. 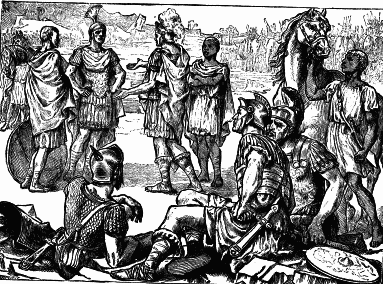 Aemilius commanded the right wing of 2,400 Roman cavalry posted near the river Aufidus. Center force of 55,000 heavy infantry and forward center position of 15,000 light infantry(McKnight 7) was commanded by the previous year’s consuls, Atilius and Servilius (Polybius219). Varro headed the Allied cavalry of 3,600 on the left wing. In total, the Roman army was a force of approximately 86,000 men. Hannibal’s army of 50,000 was much smaller than that of the Romans. However, he also had cavalry superiority, which was perfect for the flat and treeless battlefield they would be fighting on. Hasdrubal was in charge of the Spanish and Gallic cavalry of 6,500 on the left wing near the river. Hannibal and his brother, Mago, commanded the center of 10,000 Libyans, 6000 Spaniards, and 1,250 Gauls/Celts as well as the 11,500 light infantry that took up the forward position. Right wing made of 3,500 Numidian cavalry was commanded by Hanno (McKnight). The fighting had begun: it was Hasdrubal’s Spanish/Gallic cavalry versus Paullus’ Roman cavalry near the river, the main bodies of infantry in the center, and Hanno’s Numidian cavalry versus Varro’s Roman Allied cavalry on the opposite side. Varro’s plan was to smash through the Carthaginian center using sheer weight of numbers. To further this ideal, he reduced the gaps between the maniples in each line and made each maniple very deep (Goldsworthy 97) increasing its power but sacrificing its order and flexibility. 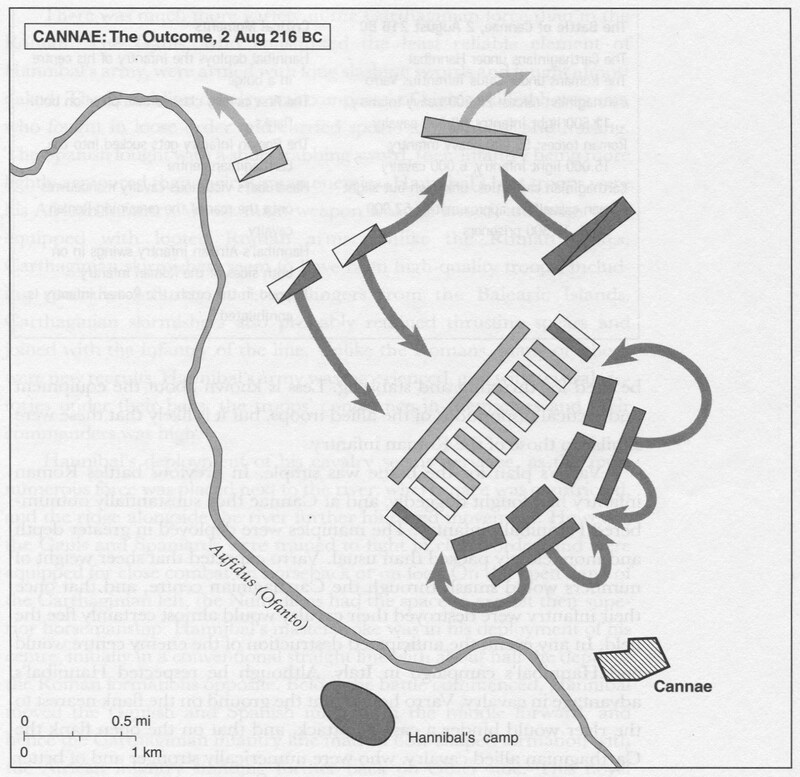 Hannibal took his straight line of infantry and moved the center forward, making a crescent shaped line that protruded out toward the enemy (Polybius 218). Near the river Afidus, Hasdrubal’s cavalry engaged Paullus’ Roman cavalry. Varro hoped that the cramped space between the river and the flank of the river army would cancel out any advantage Hasdrubal may have had in making a mobile attack. However, the Gauls and Spaniards were used to fighting in close quarters (McKnight 11). Their ferocity decimated the Roman cavalry, whose survivors were chased along the riverbank and slaughtered. Paullus escaped and rejoined the main conflict in the center. Meanwhile, the Numidian Cavalry on Hannibal’s right wing attacked the Roman Allied Cavalry facing them. The Numidians harassed them from all sides, taking turns at throwing javelins and then running away. They did not inflict or sustain any major damage but at the same time distracted the Roman allies from aiding the infantry in the main conflict. Hasdrubal’s cavalry had regrouped and came over to assist the Numidians. The outnumbered Roman Allies panicked and fled. The remaining Allied horsemen were picked off by the pursuing Numidians, whose peculiar tactics became more dangerous once they had the enemy on the run (Polybius 220). During this time, the Roman legions rushed right into Hannibal’s trap. In pursuit of the fleeing Gauls and Spaniards, the Romans had continued so far forward that they exposed both flanks to the heavy Libyan infantry. Having not yet fought, these eight to ten thousand troops were fresh and in good order (Goldsworthy 148). Startled by the energetic attack from the Libyans on either side, the Romans stopped dead in their tracks and turned to face their attackers. The Gauls and Spaniards returned, walling them in from three sides. With the Allied cavalry being taken care of by the Numidians, Hasdrubal’s horsemen joined the main conflict. Closing in and attacking from the back served to boost morale for Hannibal’s troops as well as demoralize and terrify the Romans. They were now surrounded on all sides, unable to escape because of their packed formations. Inner maniples may not have realized the danger until the men in front of them were cut down; the victorious Carthaginians annihilated the remaining Roman army rank by rank from the outside in. Goldsworthy, Adrian. Cannae. London: Cassell & Co. 1988. Print. McKnight, Sean. Holmes, Richard., ed The Hutchinson Atlas of Battle Plans. Chicago: Fitzroy Dearborn Publishers, 1998. Print. Lancel, Serge. Hannibal. Malden, Massachusetts: Blackwell Publishers Inc. The Battle of Zama took place at Zama, near Carthage, in October of 202 BC. Publius Cornelius Scipio led the Roman army and extra Numidian cavalry against Hannibal and his Carthaginian troops. The Romans soundly defeated the Carthaginians, which brought an end to the Second Punic War (Wikipedia contributors). According to Polybius, Scipio set the terms for a treaty and told the Carthaginian ambassadors. The ambassadors returned to Carthage to tell their senate, and Hannibal persuaded them to accept the “lenient terms” (Polybius). The terms of the treaty included parts beneficial to both sides, though naturally favoring the Romans. 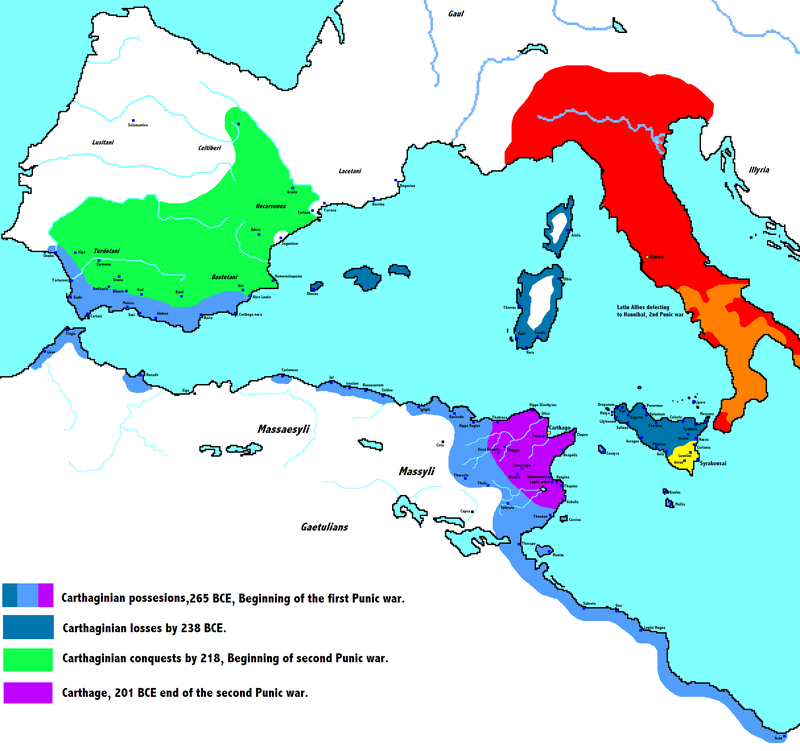 Carthage was to be a client state of Rome, but would be able to retain all territory owned prior to the war, as well as all property. Carthage would still rule itself, and no Roman garrison would be set in the city. In return, Carthage needed to return all prisoners of war and deserters to Rome, pay a tribute of 10,000 talents (200 a year for 50 years), and provide corn and pay the Roman army while they waited until Rome replied to the treaty. Also, Carthage had to give up 100 hostages (males between the age of 14 and 30), and give up their war elephants and all warships except 10 triremes. If crippling any potential land or sea force wasn’t enough, Rome forbade Carthage from making war on any nation outside of Africa, and required permission to war within Africa. F.E. Adcock suggested the Romans crippled the Carthaginian navy because they had a policy of making their states keep weak ones, so Rome wouldn’t have to build up a strong navy (118). Masinissa, of the Numidians that had helped the Romans, was crowned as the King of greater Numidia. Scipio was given the name “Africanus”, and was proclaimed a war hero (“Results of the Second Punic War”). “Results of the Second Punic War.” United Nations of Roma Victrix. UNRV.com, 2003-2011. Web. 16 Feb. 2012. Wikipedia contributors. “Battle of Zama.” Wikipedia, The Free Encyclopedia. Wikipedia, The Free Encyclopedia, 9 Dec. 2011. Web. 16 Feb. 2012. Adcock, F.E. “‘Delenda Est Carthago.’” Cambridge Historical Journal 8.3 (1946): 117-128. Print. 6 Feb. 2012. Polybius. Histories: IV. Trans. W.R. Paton. Ed. Jeffrey Henderson. Cambridge: Harvard University Press, 2000. Print.